The sleek and stylis Samsung a157's compact design is perfect for those who primarily want a device for voice calling, but also want the ability for SMS text messaging. It also gives you access to AT&T's 3G network so you're connected with speed and style. It's the technology you want � without the big monthly commitment. Other features include mobile web browsing, SMS text messaging, and speakerphone for easy hands free talking. It also comes with AT&T mobile care that allows you to get up-to-date account information, add funds, and manage your account right from your phone. You can also download ringtones and wallpapers. The Samsung a157 weighs 2.82 ounces and measures 3.76 x 1.83 x 0.65 inches. Its 800mAh li-ion battery is rated at up to 5 hours of talk time, and up to 10 days and 6 hours of standby time. 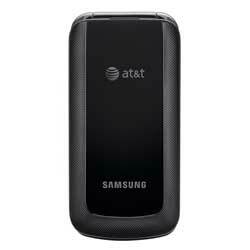 It runs on AT&T's dual-band 3G network (850/1900 MHz; HSDPA/UMTS). It has an internal memory of 256 MB.